The Model AU-4 (formerly AU-3) has most of the same features and options as the Model AU-6 except that it requires minimal floor space. 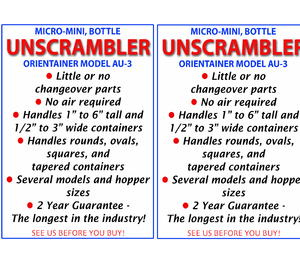 It is the smallest fully automatic unscrambler in the industry--handling a wide range of containers with little or no parts, no air and has a low profile (the maximum height is 60 inches). Virtually all styles and shapes of plastic, metal and corrugated containers can be handled in the range of 1/2 inch to 6 inches tall and up to 3 inches wide. A wide range of speeds can be obtained depending upon container size. Compact Design requires minimal floor space.